Grenville M. Dodge: Who was he? Will Braddock, the young fictional protagonist of Eagle Talons, Book One in The Iron Horse Chronicles, seeks out historical personage Grenville M. Dodge to ask for help in pursuing his quest to determine his own destiny. In developing the backstory for Will, I placed the newly orphaned boy’s late father in an Iowa regiment that would have served under Dodge during the Civil War. Sean Corcoran, Will’s uncle and only living relative, for whom he is searching in Eagle Talons, also served under Dodge, and now works for him as a railroad surveyor. Historians have taken exception to some of Dodge’s recollections in his auto-biography, How We Built the Union Pacific Railway; but since his memoirs reflect the way the great railroad engineer believed things happened, I have used Dodge’s versions in my writing unless they are obviously not correct. Grenville Mellen Dodge was born in 1831 in Massachusetts. He graduated from Norwich University in Vermont in 1851, with a degree in civil engineering. Following graduation, Dodge moved to Council Bluffs, Iowa, and performed surveying work for various railroads, including the Union Pacific. Before Abraham Lincoln was elected president, he met with Dodge in Council Bluffs in 1859. The two men discussed possible routes for a transcontinental railroad. Dodge advocated the Platte River route, which is the one Lincoln later authorized when he signed the Pacific Railroad Act in 1862. Dodge joined the Union Army at the beginning of the Civil War and rose to the rank of major general. He served with William T. Sherman at the Battle of Atlanta, where he was wounded. Dodge finished the war as commander of the Department of the Missouri, which included Kansas, Nebraska, and Utah. During 1865, on a military campaign against several hostile Indian tribes in what would become Wyoming, Dodge narrowly escaped the pursuit of a war party, which probably were Crow. In his race to safety, he discovered the pass across the Laramie Mountains that became the route taken through the Rockies by the first transcontinental railroad. Dodge resigned from the Army in 1866 and signed on as the chief engineer for the Union Pacific. He officially reported to Thomas “Doc” Durant, the UP’s vice president and general manager, who was a notorious manipulator of the company’s finances. Durant frequently disagreed with Dodge over the best route to use for the railroad’s tracks. Durant preferred a longer, more convoluted route, since the government paid for the actual miles of track laid. At one point, Dodge threatened to resign if he did not get his way, and Ulysses S. Grant supported him in maneuvering around Durant. Will Braddock witnesses this meeting of these three historical characters in Book Two—Bear Claws. Dodge and Durant will both figure prominently in Book Three—Golden Spike. In addition to his duties with the railroad, in 1866 Dodge was elected to Congress as a United States Representative from Iowa. He served from March 1867 until March 1869, during which time he lobbied for the Union Pacific and conducted negotiations with Collis Huntington, the Central Pacific’s lobbyist, on where the two railroads should join. In between sessions in the nation’s capital, he returned to the west to supervise the construction of the Union Pacific. In his memoirs, Dodge makes it clear he preferred being on the frontier working on the railroad rather than being stuck in the governing halls of Washington. Following completion of the first transcontinental railroad, Dodge performed engineering and management services for the Union Pacific and other railroads well into the 1890s. Dodge died in 1916. He is buried in Council Bluffs. 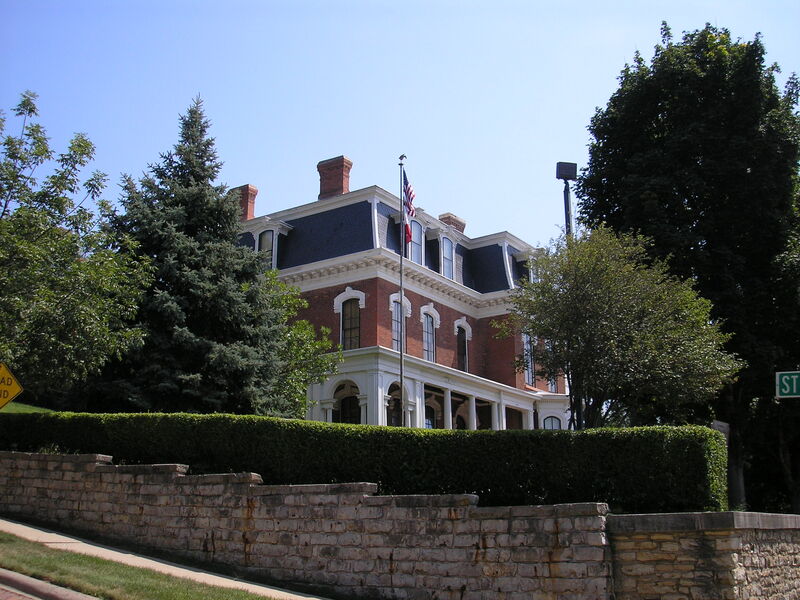 I took this picture of his long-time residence, the Grenville M. Dodge House, a National Historic Landmark, in 2008 when I commenced a research trek along the route of the transcontinental railroad. I encourage you to visit when you are in Council Bluffs. The staff will provide you an informative tour. Until you have that opportunity, you can learn more at the historic home’s website: http://www.dodgehouse.org/. This entry was posted in Eagle Talons - Book One, Iron Horse Chronicles' Characters, Museums and Parks, The Iron Horse Chronicles, Transcontinental Railroad, Union Pacific and tagged Fictional Character, Grenville M. Dodge, Historical Parks, Historical Personage, Museums. Bookmark the permalink.